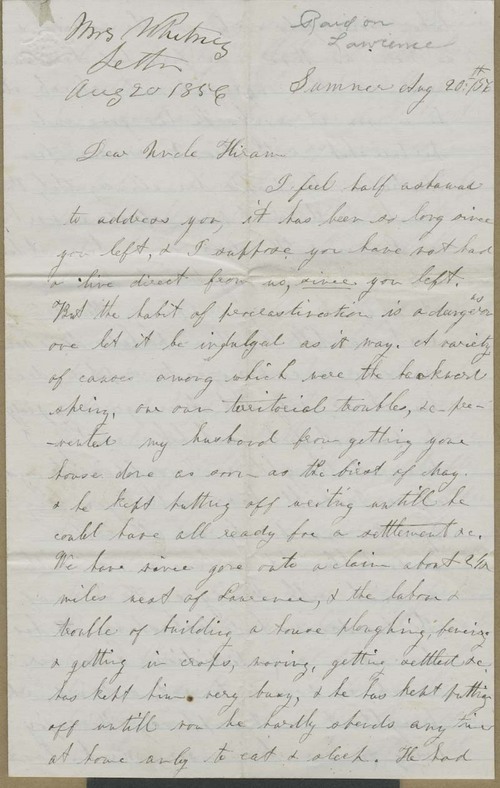 E. S. Whitney wrote from Sumner, Kansas Territory, to her uncle, Hiram Hill. Whitney apologized for the long delay in communicating with him, and explained that her husband, Thaddeus Whitney, had been very busy lately and was doing his best to complete Hill's home. She also described her experience watching the border ruffians invade Lawrence, and her friends' and neighbors' reactions to the situation. Despite the violence and uncertainty, she was "not sorry yet" that she had come to Kansas, and told Hill that her husband would write him shortly to discuss business matters. This first hand account of the Sacking of Lawrence will help students understand how serious and harmful the event was.